low Seater "Auhda" White Metal And Teak Wood Carving Centre Table "Heralding Elephants" Kandrai Work Wooden Low Table "Silver Splendour" Meenakari Wooden Bajot "Royal Flora" Three Legged Indian Drum Stool White Metal & Teak Wood Carved Low Stool " Elephant Splendour" Meenakari teakwood royal long bench Meenakari Teak Wood Corner Table" Purple Melody" Meenakari teak wood console " Royal touch"
White Metal And Teak Wood Carving Centre Table "Heralding Elephants"
trio of elephants join their bodies together to raise the top. An embellished summit sits on top of the glass to provide an ornate centre. Does not come with the glass. Glass needs to be pierced in the centre and the summit rewed on to it. 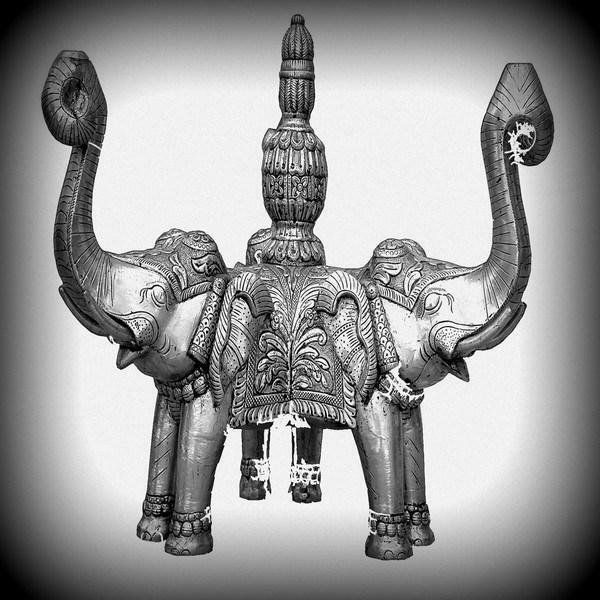 Unbelievable price on White Metal And Teak Wood Carving Centre Table "Heralding Elephants" in Gurgaon (India) company Purpledip Marketing.